Following less-than-stellar financial results, publishing giant Electronic Arts share price (pictured, below) has not only bounced back but hit its highest point of 2019 to date. 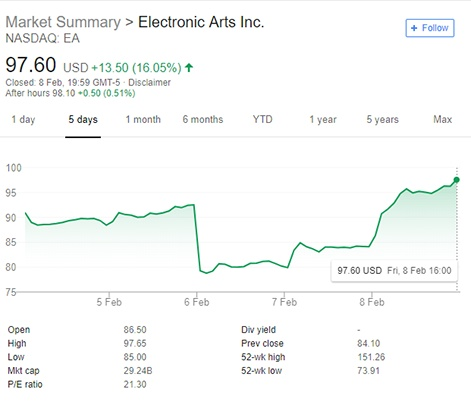 EA's stock closed at $97.60 on Friday, February 8th, a rise of 22 per cent from its $80.21 low point just two days before. The firm's stock price took an 18 per cent dip to the aforementioned low from $92.52 last week following EA's Q3 financial results. Not only had the publisher not met its expectations for this quarter, but CEO Andrew Wilson also announced that it was revising its full fiscal year new revenue targets due to market conditions. This was in part due to one of its major releases for the period, Battlefield V, not hitting the mark. The game fell one million units shy of the 8.3m copies that EA had forecast for the military shooter. There are a number of reasons why the military-themed shooter didn't quite reach the heights EA had planned for it, including the launch of Rockstar and Take-Two's Red Dead Redemption 2 - an absolute megaton release in the market - as well as, yes, Fortnite. No doubt certain corners of the internet are claiming Battlefield V falling short of EA's targets as a victory for this latest battle in their "culture war". The game came under fire for its seemingly "progressive" politics and featuring a woman on the cover, with EA responding to the backlash saying it was "not okay". The launch of free-to-play battle royale title Apex Legends right before the financial call is likely one of the main reasons why EA's stock has bounced back, in addition to the reality that investors are known to have slightly kneejerk reactions in the face of bad news. The Fortnite competitor garnered one million users within eight hours, going on to hit three million consumers in its first day on digital shelves. By the end of its 36th hour in the wild, ten million people had played the game with a concurrent user figure of one million gamers. Within three days. That's already pushing at the 1.3m concurrent player peak seen by Valve's free-to-play MOBA Dota 2 which is no mean feat. Apex Legends is a far more approachable title in a genre that is infinitely more mainstream, too, so it's hardly a fair comparison. 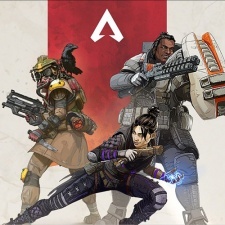 The timing of Apex Legends so close to EA announcing weaker-than-expected financial results is likely no coincidence. The publisher will have almost certainly known it needed a boost and a free-to-play battle royale title set in the Titanfall universe from the esteemed developers over at Respawn was almost certainly a solid bet - though not a dead cert - to achieve this. But the free-to-play battle royale title has been released very close to BioWare's premium sci-fi MMO title Anthem. Despite what the publishing giant would say about these titles being aimed at different audiences, Apex Legends is absolutely dominating the games landscape right now and it's definitely worth asking how many consumers are going to fork out for a premium product when they can play something that scratches that sci-fi itch with no barrier to entry. Launching similar products in the same time frame is something that EA has previous with. In fact, at the end of 2016, the publishing giant opted to release Titanfall 2 on October 28th, just one week after its own Battlefield 1's October 21st release and one week before November 4th, when Call of Duty: Infinite Warfare from rival publisher Activision Blizzard rolled out. In case you were wondering, Titanfall 2 and Battlefield 1 were for different audiences. Except one sold much better than the other.